“There Can Be Only One Highlander Club” – Despite Beverly wanting the two boys to bond, Adam and Johnny Atkins compete for the head of the Highlander Club at school. 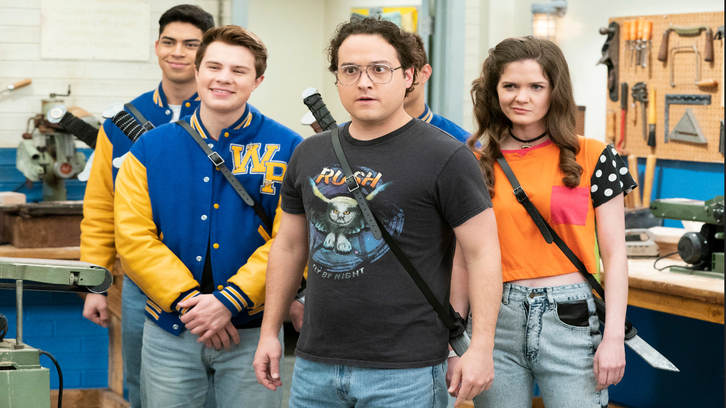 Meanwhile, Barry tries to keep him and JTP from the same fate of Murray falling out of touch with his high school friends on an all-new episode of “The Goldbergs,” airing WEDNESDAY, FEB. 20 (8:00–8:30 p.m. EST), on The ABC Television Network, streaming and on demand. “The Goldbergs” stars Wendi McLendon-Covey (“Bridesmaids”) as Beverly Goldberg, Patton Oswalt (“Ratatouille”) as adult Adam Goldberg, Sean Giambrone as Adam Goldberg, Troy Gentile (“Good Luck Chuck”) as Barry Goldberg, Hayley Orrantia (“The X Factor”) as Erica Goldberg, Sam Lerner as Geoff Schwartz, with George Segal (“Just Shoot Me”) as Pops Solomon and Jeff Garlin (“Curb Your Enthusiasm”) as Murray Goldberg. Guest starring is Clancy Brown as Mr. Crosby, Matt Bush as Andy Cogan, Noah Munck as Naked Rob, Shayne Topp as Matt Bradley, Kenny Ridwan as Dave Kim, Sean Marquette as Johnny Atkins, Alex Jennings as Carla, Zayne Emory as JC Spink, Joshua Carlon as Mike C. Levy, Zach Callison as Corbett, Nate Hartley as Dan, Niko Guardado as Ruben Amaro Jr., Sam Kindseth as Dave Sirota, Pat Finn as Kormy, Kirk Fox as Tall Jake and Chip Chinery as Dancing Bruce.